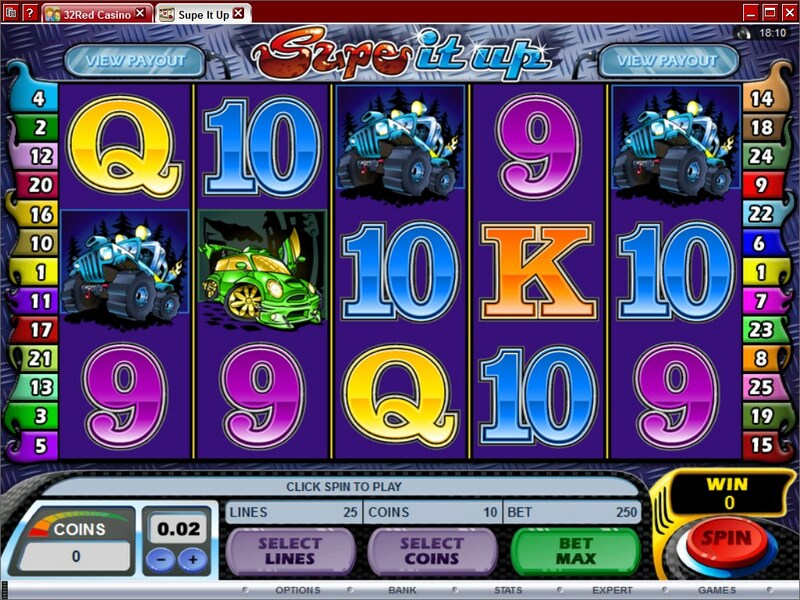 Though I’ve seen plenty of car themed slot machines so far, Supe It Up is different than most, as instead of focusing on car racing it chooses to show you cars which their owners have improved. Tuned cars are a passion for a lot of people, but the topic didn’t get a slot of its own until Supe It Up came out. The game doesn’t impress all the way, but the images of the tuned cars are very good. 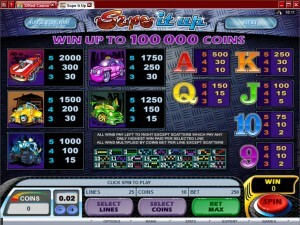 The slot is one of the titles in Microgaming’s collection. 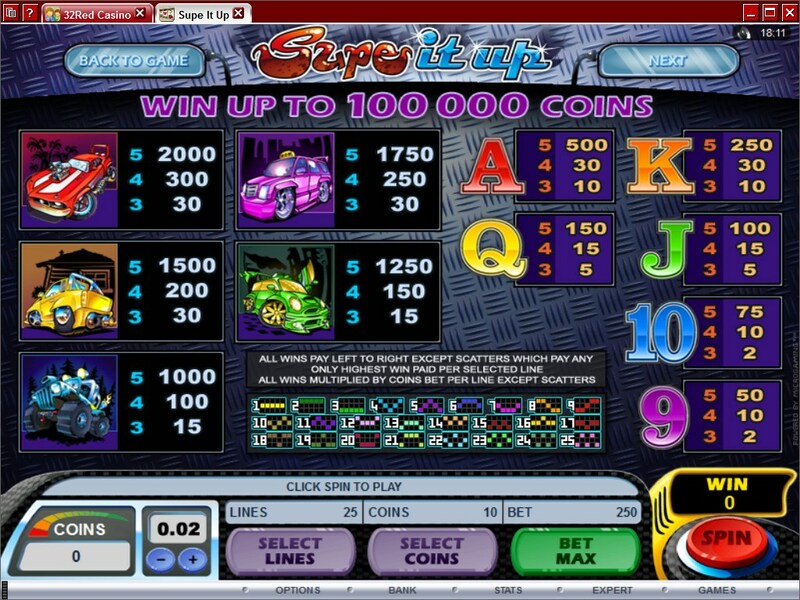 Once the game has loaded, you will find that it offers 5 reels and a total of 25 win lines. 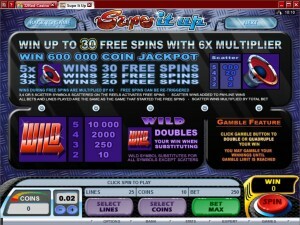 Among its features you will find a scatter symbol, a wild, multipliers and free spins. You are promised top payouts of $25,000. The topic chosen for the theme isn’t the only exciting in this case. The features are a lot of fun, starting with the wild which uses multipliers, then going to the scatter symbol with its big prizes and to the free spins with their big multipliers. Let’s take a look at the wild symbol first. It has its own WILD Logo to represent it, so it’s not going to be hard to spot. It can be helpful by appearing in random locations, or it can be the kind of symbol that creates a combo and pays a prize, like any other. While forming a combo, the symbols need to be arranged on a line which is active, and from left to right. The prizes offered by the wild reach a value of 10,000x the line wager. Wilds also work as substitutes, whenever they’re on lines where a couple of other regular icons of the same type are present. The wild can take the same role as them, in order to create a new combo or to improve an existing one. Whatever combo forms with the wild’s help, the win will be worth twice the usual amount since this feature also applies a 2x multiplier. The Speaker scatter is important both because of the prizes it offers directly, and because of the free spins it can give you. You need only two Speakers in random spots on the reels, and you will get some kind of prize from it. The best prize is for five Speakers though, where you get 600 times the triggering bet as a reward. Few games go as high with the scatter triggered prizes. The number of scatters that are present will decide how many free spins will be won. Three Speakers will bring you 20 spins for free. Four Speakers trigger 25 free spins. The maximum of five Speakers will award 30 spins. The wins obtained during these spins benefit from 6x multipliers, so there is a lot of value in this feature. If you’re looking to place a wager, you have a couple of things that you can work with. The number of active lines is one of them, up to 25 being available. The number of coins per line is next, the range here being between 1 and 10. Finally, there is the coin denomination, of $0.01 at its smallest value, or $0.25 at its highest. Add all those things up, and the maximum wager will be worth $62.50. A 10,000x multiple is a good prize to get in a slot machine, so the $25,000 which can come out of it should be a good motivator for any player. 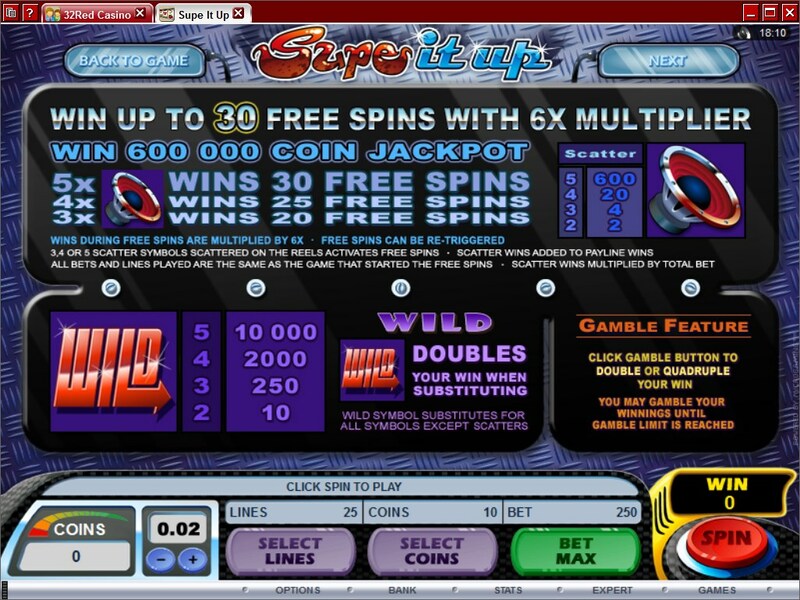 It can get even better when the free spins are involved, since they have 6x multipliers. The betting area is made to look like the dashboard of a car, which is a nice touch. I’m disappointed in their use of playing cards that look so boring, they could’ve at least tried to make them look car related. The car themed symbols look great though, plenty of details used in them, though they’re more like cartoons than real cars. The overall impression is that the game could’ve used more work. Symbols: Wild Logo (10,000x, wild), Horn (600x the bet, scatter), Red Car (2,000x), Pink Cab (1,750x), Yellow Car (1,500x), Green Car (1,250x), Blue Truck (1,000x), Ace (500x), King (250x), Queen (150x), Jack (100x), 10 (75x) and 9 (50x). I’ve enjoyed plenty of things about this game, but the prize would be the best one. Starting with the 10,000x jackpot, the 6x multiplier of the free spins and the scatter awarded prizes of up to 600x the bet, the game does a lot to make sure you’re going to be motivated enough to play it. 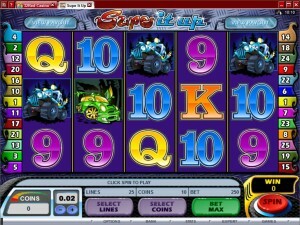 Supe It Up can be found at any Microgaming casino, where you get a chance to play it for real money or in free mode.